When my cousin asked me if I wanted to drive his 1957 Ford Club Victoria, of course I told him yes. I think the entire neighborhood came outside to watch me fail. Unfortunately for them, operating the old car was relatively simple once I figured out how the door, ignition, and shift worked. At first, I drove cautiously around pot-craters and garbage piles in the road, but eventually, I got comfortable with the car. My cousin and I rolled the windows down (literally) to enjoy the thick wet breeze and the Caribbean sun. The absence of stop signs or traffic signals stymied me when we approached an intersection, but thankfully the roads were vacant. Overall, I was doing fine... until I felt something ram into the side of the car and heard an agonizing baaaaaah. A wandering goat looking to cross the street was upset with how slowly the car was moving. When we returned to my cousin's garage, I thanked him for letting me take his precious baby for a ride. He assured me his car means much more than a baby, "Because unlike a baby, it's not easy to make another one." This is Cuba: to some, a paradise preserved by a self-imposed blockade; to others, a country on the cusp of collapse. Preserved cars and colonial buildings are relics of a forgotten era of affluence and symbols of an era of prolonged economic stagnation that Cuba cannot escape. The trade embargo implemented by the United States in 1958 has prevented Cuba from modernizing; Cubans maintain old American cars because they cannot import new ones. My grandma, who fled Cuba when she was 14, has told me stories about rotting fruit being distributed in rotting buildings by rotten people while hundreds of people waited in line for their rations booklet to be checked. After diplomatic relations between Cuba and the United States improved in the last decade, my grandma and I were eager to discover if Cuba had changed since her last visit in 1995. How has the trade embargo affected the lives of ordinary people? Has the hope of the nation been resuscitated, or has it already drowned? I flew to Havana to find out. Technically, my grandma and I flew to Varadero, a city 70 miles east of Havana. After speeding through the tiny, empty airport, we got on an air-conditioned bus that took us from Varadero to our hotel in Havana. Some movie was playing on a television towards the front of the bus. It didn’t matter. I was captivated by the world beyond my window. There were no street lights outside of large cities. Dim, distant porch lights were like stars guiding us through mountains in the night. To the right, a one-hundred-foot cliff was all that separated us from the Caribbean Sea; to the left, curved tree trunks sprouted out of the side of mountains whose tips I could not see. The bus ride added three hours to our journey, but I wish the drive would have taken longer. I should have given in to my urge to tumble roll out of the moving bus and explore Cuba's untouched countryside. My grandma and I arrived at the Hotel Nacional after midnight. After five failed email attempts, I used the hotel’s phone to call my cousin Mayelin to confirm that she could meet us in the lobby the next morning. Mayelin met us 20 minutes late the next day. Apparently, the bus was late. I didn't care. I had waited my whole life to meet my cousin. What was another 20 minutes? Most people are too young to remember meeting their family for the first time. Meeting my cousin as an adult felt odd. What do you say to someone who is simultaneously a stranger and someone you’re expected to love? Could I relate to this 40-year-old relative, or would we get lost in translation trying to connect to each other’s drastically different lives? Despite my doubts, I dared to start a conversation with her. I'm not fluent in Spanish, but I knew enough to ask to her what she thought I should see in Havana. 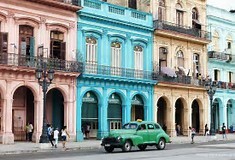 Mayelin replied that no one should leave Cuba without seeing Havana Vieja (Old Havana), and suggested we take a taxi there. I started walking towards the group of cigarette-smoking taxi drivers conversing in front of their cars behind the hotel. Mayelin shouted no. These yellow cars, she explained, have non-negotiable high prices because their drivers, like most Cubans, work for the government. The drivers are not paid on commission, and they cannot be fired. They have no incentive to care. The three of us proceeded down the street and searched for a privately-owned taxi instead. Once we flagged a taxi, I asked the driver how people like him preserved their cars for over 60 years. "We have to," he replied. "We can't get new cars or parts." He pointed to a billboard picturing Cuba ensnared in a noose: Bloque – El genocidio más largo de la historia (The embargo - The longest genocide in history). I started noticing all the propaganda I missed during the darkness of the previous evening. Anti-American and anti-capitalism slogans were portrayed instead of advertisements on billboards. Fidel Castro and Che Guevara were revered like lords. We spent the day roaming Havana Vieja. It would have taken months for my grandma and I to see all that deserves to be seen. Luckily, Mayelin was there to show us some of her favorite parts of the city. She insisted we got drinks at La Marina, one of the only restaurants in the world that serves freshly made "guarapo," a drink made by grinding sugarcane in a machine resembling a medieval torture device and mixing the fine-ground sugar with Cuban rum.It tastes like adventure, and it the best beverage I had in Cuba by far. For the first time in my life, I could legally buy alcohol, so I bought a lot of it. From there, Mayelin led us to the Cuban Capitol Building. It looked almost identical to the United States' Capital Building— they were even renovating the dome on top of the roof. "That's the building where most of the government work," she said. "They're slowly improving it." 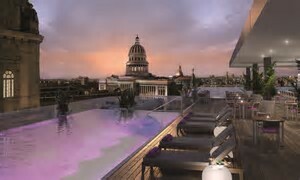 She showed us the Gran Hotel Manzana Kempinski La Habana, Cuba's newest luxury hotel housed in Havana's historic Manzana de Gómez building, due to open June 7th. "A lot more people have been coming to Cuba in the last five years," Mayelin remarked, "So they decided we needed a 5-star hotel in the center of the city." We walked home along the Malecón, a road that stretches 20 miles along the coast of Havana. 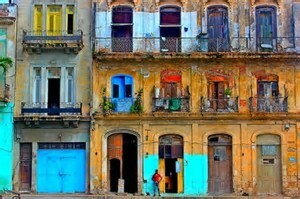 Officially, the Malecón is Havana's busiest street; unofficially, it's Havana's busiest national landmark. A stone wall that prevents waves from crashing over the street provides a picturesque place for people to pass time. Every evening, waves of Cubans and waves of the Caribbean Sea meet at the Malecón. There are always people relaxing on the walls, and they will talk to anyone about anything besides politics. One man I spoke with along the Malecón got excited when I told him I was American. He told me about his brother living in Washington D.C. Unlike most Cubans I talked to that night, this person was not afraid to talk freely about relations between our two nations. He compared the United States and Cuba to an older and younger brother. The American government— which he ironically referred to as "Big Brother"— does something, and then it expects Cuba to do the same. Cuba, however, wants to establish its own identity, so it rebels by doing the opposite of whatever Big Brother does. He concluded his analogy by stating that the United States has always desired to control Cuba, while Cuba simply wants to be rid of America's influence. The man pointed to a structure in the distance away to our right. This structure was the Maine Monument, built in honor of those who lost their lives when the U.S.S. Maine sunk off the coast of Havana. He said that when the memorial was first built, a bald eagle sculpture sat atop the twin arches. 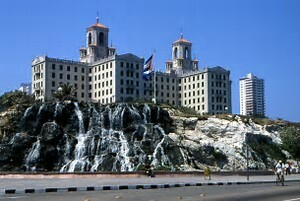 In 1961, a mob tore down the American eagle watching over Havana. Some Americans believe that improved relations between the two nations may one day be symbolized by placing a new eagle atop the monument, but this man did not believe that would happen anytime soon. "Cubans don't want the American eagle hovering over our island," he said. "We just want to be free— you, of all countries, should understand that." If witnessing Havana Vieja was like traveling 70 years back in time, my trip to Cotorro took me back 70 years more. My grandma and I took a taxi to Mayelin's house so that we could meet the rest of our relatives. 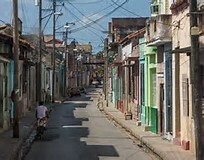 Cotorro, a suburban village eight miles east of central Havana, was reminiscent of a ghost town from Western movies. I formed dust clouds trekking through silent streets of dirt. The humming engine of our taxi— the only car in sight— was the only sound that pierced the air. Hundreds of haunting eyes peered at us from wooden porches. We were no longer tourists, but intruders. Mayelin's house wasn't far from where our taxi left us. There were neither street signs nor addresses to guide us, but my grandma and I arrived at a house resembling the one Mayelin described. We brushed past a bush, walked up the cracked concrete step, and knocked on the door of the sky-blue house. To my amazement and relief, my cousin answered the door. We were welcomed by six family members I'd never met. Nothing inside the house had changed since my grandma’s last visit in 1995— including the people. My grandma and my relatives gossiped like it had been days, not decades, since they had last spoken. She even sat in the same wobbly chair she did the last time she visited. Mayelin gave me a tour of her two-room house and introduced me to everyone. None of them spoke English. Usually, time ticks slowly in Cuba, but that day, the minute hand spun around the clock like it was running a race. By the time we finished talking about our families, friends, and favorite soccer players, two of my cousins told us lunch was ready. We sat in a circle on the icy stone floor enjoying tamales, pork, mangoes, beans, and rice. My cousin Jorge told me that the mangoes came from a tree behind their house. "Almost all the fruit we eat," he added, "comes from these trees because we don't get much fruit with our rations... actually, we don't get much anything with our rations." I asked him how he could cook all this food if his monthly rations aren't even enough for two people. He said he had to buy food from the "Tourist Store," and that without the extra money his American relatives give him, he would starve. After lunch, Mayelin and my cousin Roberto showed me around the village. Some buildings were in relatively good condition. Some weren't. Cats, dogs, goats, chickens, and peacocks roamed the streets. I even watched a man wrestle an adult pig (the pig won). There were churches where no one worshiped, shops where no one shopped, and restaurants where no one ate. There were parks without people, fountains without water, and garages without cars (except for two, one of which was the car Roberto let me drive). What I will remember most was their market. The market was one of the largest buildings in town, but it wasn't one-tenth the size of an average Walmart or Tops. Iron bars in the windows and door distinguished this building from any other in town. The only thing the market had in common with other buildings was that its isles— and, from what I could see, its shelves— were empty. I wanted to go inside, but Mayelin said nobody can enter without a rations booklet. Secretly, I asked a kid juggling a soccer ball outside the store if he knew how I could get inside. He told me that there was nothing to see, because the month's food rations are given out on the first of every month. The child said if I returned on July 1st, he would take me inside— if I would be willing to wait in line for four or five hours like everyone else in the village who wanted food. He also made me promise to show him an American "supermarket" where "there's so much food, they throw some away" if he ever made it to the U.S.
Mayelin and I sat on the step when we returned to her house. I asked her what the ominous factory across the street was, and she told me it was a steel plant. She added that this plant has been trying to produce more steel to compensate for the steel Venezuela hasn't been able to ship to Cuba. "Do you think Cubans will ever protest their government like the Venezuelans?" I asked. "Why not? If Cubans rebelled, they could topple the communist regime and replace it with a democracy. The U.S. or U.N. might even help if the people started a revolution." Mayelin laughed at me and shook her head. "We're not falling for that one again." She laughed a few seconds more before she continued. "Besides, who says the new government would be any better than this one? There aren’t many rich people in Cuba, but no one is hopelessly poor. In other Caribbean countries, if people can't afford food or medical treatment, they just die. That's why there's so much theft and violence. America too." I explained that in America, food stamps, welfare, and other federally-funded assistance programs help the most destitute members of society. "The government takes your money and gives it to the poor? That sounds pretty socialist to me," said Mayelin. Time continued to tick too quickly for the rest of week. On my last day in Cuba, Mayelin asked me if I would return one day. I also joked that I would like to buy a cottage in Cuba when I'm older. She told me that the only way I could own a home in Cuba would be to live in it – only Cuban citizens can buy property in Cuba. "That's why hundreds of huge hotels aren't popping up," she said. "But wouldn't more hotels help the economy?" "How? It would just be American tourists paying American employees in American hotels. They wouldn't even need to exchange money or speak Spanish." She laughed, and then added, "This isn't Jamaica." Cuba is a lot of things, but it's certainly not Jamaica. This is Cuba: an island ensnared in an economic embargo that has trapped 11 million people in time. Cuba is unlike any other Caribbean country. Of all islands in the Caribbean, Cuba is the largest by far. It's impossible to experience the whole nation (or even 3 cities) in a month. There are also distinct regional differences within Cuba. From coastal old towns (Havana, Trinidad) to mesmerizing mountains (Cienfuegos) to traditional beaches (Matanzas, Veradero) to deserts (Santiago de Cuba, Guantanamo) to tropics (Santa Clara), every Cuban city has its own identity. As one of the world's last remaining socialist countries, even Cuba's relationship to the United States is unique. Havana will celebrate its 500th anniversary as a city in 2020. Despite its history, Havana has never been truly free. Cuba has suffered from a strained relationship with "Big Brother." After over a half-century of silence, the two nations are finally on speaking terms again. President Obama revitalized diplomatic relations in Cuba in 2015. (Then President Trump rescinded it last month). Despite this, our shattered relationship with the Cuban government is likely beyond repair. They despise everything we want them to be. With relations worsening, I advise anyone planning a trip to go as soon as possible... but if you can't make it this summer, don't worry. Not much changes in Cuba. I hope that prosperity will one day return to the people of Cuba. They've been waiting in line for a while.